After seven years with Bart Starr as head coach, the Green Bay Packers had yet to make it to the postseason and fans and the team’s directors were getting frustrated. Starr, who as a Hall of Fame quarterback had been a part of five NFL titles during the Vince Lombardi coaching era, received a contract extension following an 8-8 tally in 1981 in which the Packers started poorly but finished strong and just missed being a Wild Card team. The offense featured a strong passing game with QB Lynn Dickey (pictured above) throwing to wide receivers James Lofton and John Jefferson, as well as TE Paul Coffman. There were questions with regard to the running game, however, due to talented RB Eddie Lee Ivery’s two knee surgeries in three years, and the defense lacked a strong pass rush as well as overall consistency. Starr’s future with the team rested on making it to the playoffs in ’82. On September 12, 1982 the Packers opened at home against the Los Angeles Rams. After consistently contending throughout the 1970s and winning a NFC title in ’79, LA had dropped to 6-10 in 1981 – the team’s first losing record since 1972. The front office had made moves to bring in fresh veteran talent, most notably QB Bert Jones and TE Mike Barber. Jones had starred for the Colts before his career was derailed by injuries and, when he returned, the club was in decline. Barber was obtained from the Oilers, where he had shown promise but was pushed aside by ex-Raider Dave Casper. There were 53,694 fans in attendance at Milwaukee’s County Stadium and they spent much of the first half venting their frustration. The Packers fumbled the ball away in their own territory on each of their first three possessions and five times overall in the first half. The Rams directly benefited in the first quarter as RB Wendell Tyler ran for a four-yard touchdown and Mike Lansford kicked a 32-yard field goal, both following turnovers. In the second quarter, LA put together a 51-yard scoring drive that concluded with a 10-yard TD pass from Jones to Barber. Lansford added field goals of 29 and 28 yards and the Packers left the field to a loud chorus of boos and behind by a score of 23-0. 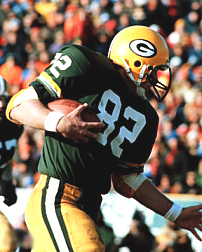 To make matters worse, Green Bay had lost starting FB Gerry Ellis due to a twisted knee. Coach Starr considered pulling Dickey in favor of backup David Whitehurst for the second half, but decided against making a move. When Green Bay’s defense stopped the Rams in their first possession of the second half, it was a sign of momentum about to shift. Dickey responded with a four-yard touchdown pass to Coffman to get the Packers on the board. Before the third quarter was over, Eddie Lee Ivery ran for a three-yard TD and LA’s lead was cut to 23-14. The Rams failed to get a first down in the third quarter as the first half roles now were reversed. Heading into the fourth quarter, John Jefferson set up Green Bay’s third touchdown with a reception that covered 50 yards, although he suffered a hamstring pull and sat out the rest of the game. 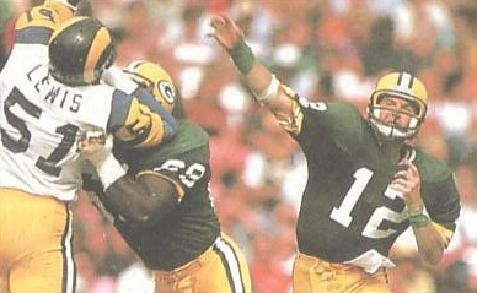 The Packers continued their 66-yard drive that concluded when Dickey threw to James Lofton for a 15-yard TD. Following Jan Stenerud’s successful extra point, the home team was just two points behind. The Rams fumbled on the ensuing kickoff, a squib kick by Stenerud that RB Robert Alexander couldn’t handle, and Green Bay immediately scored again on the next play as Dickey tossed a 10-yard touchdown pass to Coffman. Now down by five points, the Rams fought back as Jones completed three passes to move them to the Green Bay 31. But two runs gained just a yard and Jones was sacked for an eight-yard loss on third down, forcing a punt. With just over six minutes remaining in the game, the Rams had another shot but LB George Cumby intercepted a Jones pass at the Green Bay 30. Ivery added an insurance score with a 27-yard run up the middle for a touchdown late in the fourth quarter. LA’s last opportunity came with 2:58 to play. The Rams again drove to the Green Bay 32 but this time it was LB John Anderson picking off Jones and that was it as the Packers came away with a stunning 35-23 win. Green Bay outgained the Rams (377 yards to 271) and had more first downs (22 to 12). The Packers turned the ball over a total of six times, which had put them in the early hole, while Los Angeles suffered three, including the two fourth quarter interceptions that snuffed out their comeback hopes. They also hurt themselves with 11 penalties that cost them 88 yards, to two flags thrown on Green Bay. The Packers sacked Jones four times while LA got to Dickey twice. Lynn Dickey completed 17 of 27 passes for 237 yards and three touchdowns along with three interceptions. John Jefferson caught 6 passes for 116 yards before he had to leave the game while Paul Coffman (pictured at left) added 4 receptions for 66 yards and two TDs and James Lofton pulled in 4 passes for 59 yards and a score. Eddie Lee Ivery had a fine performance as he gained 109 yards on 17 carries that included two touchdowns. For the Rams, Bert Jones was successful on 17 of 31 passes for 202 yards and a TD and the two late interceptions. FB Mike Guman and RB Jewerl Thomas each caught four passes, for 37 and 28 yards, respectively, and WR Willie Miller gained 78 yards on his three receptions. Wendell Tyler paced the running attack with 57 yards on 14 carries that included a TD and added three catches for 32 more yards. “That’s the greatest comeback I’ve ever witnessed,” said an elated Bart Starr. After beating the Giants the next week, a players’ strike wiped out the next two months of the season. With the divisions eliminated in an abbreviated nine-game regular season when play resumed, the Packers qualified for the playoffs by finishing third in the NFC with a 5-3-1 record. They won their first postseason game over the Cardinals but lost to Dallas in the next round. The Rams suffered through a dismal 2-7 campaign, ending up at the bottom of the conference and costing Coach Malavasi his job. Over the course of the short season, Lynn Dickey passed for 1790 yards and 12 touchdowns while averaging a league-leading 14.4 yards per completion and ranking third with 8.2 yards per attempt. James Lofton (35 catches, 696 yards, 19.9 avg. ), John Jefferson (27 receptions, 452 yards, 16.7 avg. ), and Paul Coffman (23 catches, 287 yards, 12.5 avg.) all were selected to the Pro Bowl. Eddie Lee Ivery stayed healthy and rushed for 453 yards and 9 TDs. Bert Jones had a disappointing year with Los Angeles, playing in just four games before being sidelined by a neck injury that proved to be career-ending. He threw for just 527 yards with two touchdowns and four interceptions in what was the bitter end to a once-impressive career that was done in by injuries.